AutoIt is a simple tool that can simulate keystokes, mouse movements and window commands (maximize, minimize, wait for, etc.) in order to automate any windows based task (or even windowed DOS tasks). It was primarily designed to assist in automatically installing software that cannot be automatically installed by other means. This is most useful during a PC rollout where hundreds or thousands of client machines need to be automatically installed. However, it is not limited to software installation and can be used to automate most simple windows tasks. A feature rich Windows automation language. The main competitor might be AutoHotKey. The reason I chose AutoIt is better syntax and COM automation. 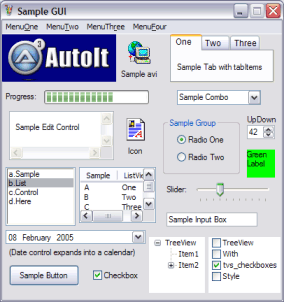 Later on AutoIt can be embedded to other applications with a dll file. Kudos with this realease!!! It no longer wants to reinstall all the necessary third-party sdk's / runtimes! I have used this app for well over a year now and I have to say it beats many other script languages hands-down. I have written full-blown applications with it that migrate printers, run entire processes under another user context, full GUI based applications for loads of different tasks and a shed-load more besides. Every time I see AutoIT mentioned somewhere it simply says that it is a keystroke macro app but essentially it is a full-blown script language as powerfull as vbs if not more so. When coupled with the freeware SciTe editor for authoring purposes AutoIT3 is awesome. Best of all your creations can be compiled into self-contained executables (try that one with a vbs file and no 3rd party apps!). Nice, lightweight macro builder. Works as advertised. Anyone that appreciates BASIC would argue about that being friendlier syntax? Yes it's concise, but that doesn't necessarily make it better or more powerful. The help file is awesome just like in Inno Setup. One problem with both InnoSetup and AutoIt is that neither are true compilers. A considerable linguistic weakness is the lack of a goto statement, which forces you to work a little harder in some rare instances. That being said I honestly prefer this over VS 2005 for slightly less than half of my development needs. It's simple and does the job, and doesn't require 10-20MB in runtimes. Moreover the help file actually has examples almost everywhere unlike MSDN. AutoIt is a great scripting language. The forum will help you if you show an effort at trying to accomplish your task. The Betas improve all the time. I've actually been using this as a full-blown scripting language. There's very little that can't be done with AutoIt. It doesn't replace languages such as BASIC or Python but it sure is a great addition to any programming/scripting toolkit. I hope AutoIt develops into a true programming language one day. The possibilities are near endless. This tool allows you to quickly script things that are difficult to figure out how to do with C++ and the WinAPI. For example, there are a few open/save dialog extenders out there (that extend all on the system), but most cost $$$, which isn't cool. So I made a tray script that sits around and finds an open/save dialog, and resizes it, sets an initial view on the file list, and gives the dialog transparency. Although a true "extender" would be able to do much more than that though the WinAPI and dialog hooks, it's a good start for just a 30 minute script. It's even possible to make custom-drawn menus using this, although I eventually realized how insane that idea was and remade it in .NET instead. Still, it's possible to do lots of stuff outside automation. I like it's ability to simulate being at work, when I am not. Delaying emails and other PC activity is cool. One area where AutoIt excels is its documentation. From what I've seen there's an example for every command in the program. I can't think of another programming language, commercial or free that can claim that.